When reading this book, you are hit right off the bat with Neil’s humor and wit and love for storytelling. And intertwined in the mix are delicious tidbits of insightful resourcefulness and experience from his been-there, done-that entrepreneurial life. Rule #220 – Treat your Superstars well, if not, they may leave and take your universe with them. When I read this rule, it made me think about the 80/20 rule and how entrepreneurs should be mindful to take care of the top 20 percent of their clientele because that is where the loyalty is. Rule #243 – Do you actually think your customer is stupid or do you just tread him that way? This rule reminds me of the principle of “being your customer” and remember that you need to KNOW who you customer is in order to be able to be the go-to person for them. Rule #300 – It never hurts to ask. This rule speaks directly to me and this is something I share with others all the time. This is what I tell others….if you don’t ask the question, the answer is automatically “no”. You negate the possibility of yes if you don’t ask the question. So if you want to ask someone to talk with you or do a joint venture with you or even connect with you….ask! Success, failure, joy, pain, and rejection. Neil Senturia shares the ups and downs of his entrepreneurial life and how the lessons learned along his journey can be applied to all of our lives. The book reads like Neil talks (with the occasional four letter word!) so be prepared for a humorous and insightful read. Two hundred and twenty three of his Baby Rules are included here, and you ll have to wait for Volume 2 for the rest. Neil Senturia has re-invented himself several times in his relentless pursuit of entrepreneurial success. Currently he is the CEO of Blackbird Ventures, an investor in high growth potential companies. He also serves as the chairman of the board of directors of Valore, an online marketplace for the sale and rental of used textbooks. Neilâs diverse endeavors range from writing sitcoms to technology with a stint as a real estate developer in the middle. He has been CEO of six technology companies, three in software, one in material science, one in media and most recently clean tech. His companies have been sold to Cisco, Kofax and Lockheed Martin. And no bio is complete without noting that one of the six went broke. Neil has taught new venture creation as an adjunct professor in the MBA program at San Diego State University and has served on the board of directors of SDSUâs Entrepreneurial Management Center. Currently he teaches entrepreneurship at UC San Diegoâs Jacobs School of Engineering von Liebig Center for Entrepreneurism and Technology Advancement (http://www.vonliebig.ucsd.edu). He is a member of the San Diego Venture Group (http:/www.sdvg.org) and the MIT Enterprise Forum. His numerous honors include winning the Microsoft Retail Application Developer Award twice, the Arnie Karush award from the San Diego Software Industry Council, CONNECTâs Most Innovative New Product Award in software, and CONNECTâs Lifetime Contribution Award in Technology. Neil graduated from Tufts University with a B.A. degree in English and received a mastersâ degree in cinema from New York University. He was a Fellow at the American Film Institute in Los Angeles and served in the U.S. Army from which he received an honorable discharge. He is married to Barbara Bry, and their blended family includes four children between the ages of 25 and 29, and Momo, a Himalayan cat. 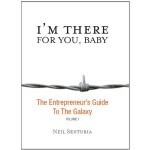 You can purchase a copy of ‘I’m There for You, Baby: The Entrepreneur’s Guide to the Galaxy’ online at Amazon. *this information came from Amazon. Next, I would like to introduce you to another book on the business book list on Amazon and on my reading list: ‘Social BOOM!’. I can attest to Gitomer’s wonderful writing style and never ending insights about business sales (I have purchased several of his books) and now he has written about the mix of social media within the business world…all I can say is I am so looking forward to reading this book! Social BOOM! contains every aspect of social media, including the business periphery (blog, personal website, e-zine) that you need in order to create the real law of attraction. When you create a connection, itâs an indicator that that prospect, or that customer, or that person wants to continue the online relationship, which may lead to real business. Graduate from social media to business social media by creating value that others will perceive as important to fulfilling their needs. As you go through each aspect of this foundation-building, platform-building book, you will read the ideas that Gitomer and others are using right now. None of the ideas are random. All of them are fully tested and can be implemented by you, too. None of the ideas contain solicitation (buy my product, make a lot of money). All of them get you and your brand out there in a systematic way that will bring in dollars. Gitomer has invited a number of social media experts to âguest speakâ in the book, to help you get a wider range of views and options. The best part about this book is that the minute you begin to read it, if your laptop or mobile device is handy, you can begin to implement it in the same minute. I remember my mother chasing my car as I backed out of the driveway to register on my first day of college: “Take pre-med!” she screamed, “You can always switch!” But I wanted to be a businessman, like my dad. He was the consummate entrepreneur. Growing up, I used to sneak downstairs and listen in on his Thursday night pinochle game. Arguments and laughs about business and life. It proved to be my inspiration for my life’s pursuits. My pal, Duke Dalton said, “You know what I hate about your old man? He’s never wrong.” I miss my folks, and I’m grateful to them for their wisdom – the stuff they accused me of never listening to for 30+ years. If your parents are alive, call them right now and tell them you love them. In college, I played Scrabble every day with my best friend, Michael Toll. He usually won. It taught me about words and how to use them. Michael also provided me with the challenge of winning at games, both sports and intellectual. He’ll tell you he was better than me at everything. I feel the same about him. That was the fun. I spent a year in Europe and came to the realization that I knew very little compared to what there was to know, which is funny, because I left for Europe knowing everything. I raised a family. My three beautiful daughters taught me patience. They also gave me the courage and inspiration to achieve in the face of failure. Girls, I love you. And I became a salesman. My first goal was to be the best salesman in the world. I’m still on that journey, every day. In the pursuit of that goal I surprised myself by becoming a columnist, an author, a speaker, a consultant, and a sales trainer. I used to hate flying. Now I spend about a quarter of my life in an airplane. But I really don’t mind, because it gives me the precious opportunity to share my sales knowledge and my secrets with a worldwide audience. What could be better? My name is Jeffrey Gitomer. I’m a salesman. I’m a dad. I’m a college dropout. My objective in life is to help others, establish long-term relationships, and have fun – every day. When you love your work like I do, every day is the same. It’s a holiday. You can purchase a copy of ‘Social BOOM!’ at Amazon. Filed Under: Business Book, Business Life, Successful Blog Tagged With: Business Book, Jeffrey Gitomer, Neil Sentruria, Social Boom!